Nigeria is one of the biggest gensets markets in Africa region- with over 60 million of the population, the country heavily rely on gensets to meet the power back up requirement. Lack of power infrastructure and existing power plants working only at one third of their potential have led for the demand for diesel gensets in the country. According to 6Wresearch, Nigeria diesel genset market is projected to touch $694.8 million by 2022. In Nigeria, diesel gensets with rating less than 750 KVA accounted for majority of the market share due to extensive power shortage in the country. In the forecast period, 5-75 KVA range would continue to show its dominance in volume terms in Nigerian market. The regional share of diesel genset market is dominated by northern Nigeria. Even though most of the industries and major tourist destinations are situated in the southern region but northern region with its large population and virtually zero generation of electricity has led to the maximum revenue share of diesel gensets for this region. 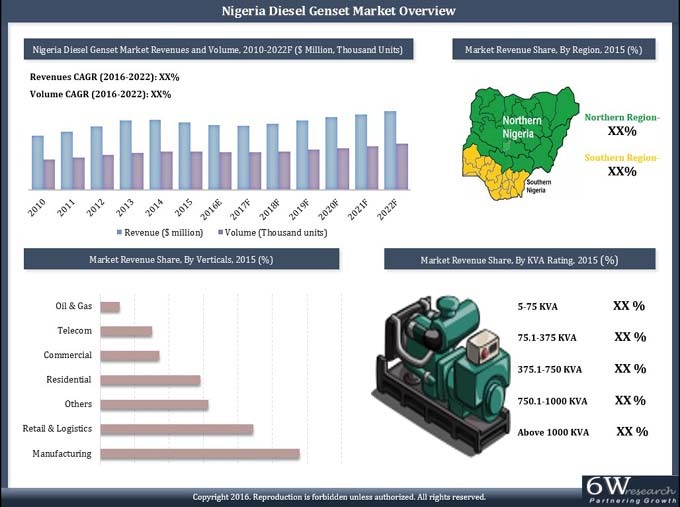 The report thoroughly covers Nigeria Diesel Genset market by KVA ratings, verticals and regions. The report provides the unbiased and detailed analysis of the on-going trends, opportunities / high growth areas, market drivers which would help the stakeholders to device and align their market strategies according to the current and future market dynamics. •	Historical Data of Nigeria Diesel Genset Market Revenues and Volume for the Period 2010-2015. •	Market Size & Forecast of Nigeria Diesel Genset Market Revenues and Volume until 2022. •	Historical Data of Nigeria Diesel Genset Market Revenues by KVA Rating for the Period 2010-2015. •	Market Size & Forecast of Nigeria Diesel Genset Market Revenues by KVA Rating until 2022. •	Historical Data of Nigeria Diesel Genset Market Volume by KVA Rating for the Period 2010-2015. •	Market Size & Forecast of Nigeria Diesel Genset Market Volume by KVA Rating until 2022. •	Historical Data of Nigeria Diesel Genset Market Revenues by Verticals for the Period 2010-2015. •	Market Size & Forecast of Nigeria Diesel Genset Market Revenues by Verticals until 2022. •	Historical Data of Nigeria Diesel Genset Market Revenues by KVA Ratings by Verticals for the Period 2010-2015. •	Market Size & Forecast of Nigeria Diesel Genset Market Revenues by KVA Ratings by Verticals until 2022. •	Historical Data of Nigeria Diesel genset Market Revenues by Regions for the Period 2010-2015. •	Market Size & Forecast of Nigeria Diesel genset Market Revenues by Regions until 2022. 17.8	Perkins Engines Co. Ltd.
17.9	Kirloskar Oil Engines Ltd.